The last two years have kept me more than busy. Now there is some time to be able to focus on my painting and the final proofs of the book. The Emil Carlsen book has over 1000 images and with new works arriving at auction it has really kept me scrambling. But, there is a time when you must stop and just go with it. So that time is rapidly approaching. I am trying to approve the final proofs before late summer. Here is the book abstract for those that are interested. Several fans of Carlsen have contacted me and based on your suggestions I am now using a larger format than the 8.5" x 8.5" format. I have made it the largest printable format 12" x 12". Now bulging at more than 1000+ pages the book will be in two volumes. One with the essays and the other with the just the images and descriptions of each painting. This way visually it is clean and simple. Hopefully it will allow students to purchase the images without spending for the entire book. The pages now are black and the description layouts are more simple and streamline. Thanks to all for their kind suggestions! Emil Carlsen, Danish American artist and educator [1848-1932] has won a major painting award every year of his life since the age of twenty-nine -- yet a comprehensive book about the man and his work has never been published. Carlsen's closest friends, who nurtured his painting technique included nineteenth century America's most prominent painters: Chase, Weir, Twatchman, and Hassam. Emil Carlsen's style blurred the line between Realism and Impressionism while remaining unique. A quiet loner, Emil's expansive body of work is nearly absent from every major museum around the world but has been preserved through the caring hands of private collectors making this an invaluable resource to collectors, scholars, and artists. Emil Carlsen: The Complete Known Works lavishly illustrates more than one thousand paintings by the artist using reference images, authoritative essays and painting research including: provenance, exhibition history, bibliographic references, and past / current values. The biographical essay provided by Danish art historian, Kim Lykke Jensen (author of several Danish art books) with a technical essay by William Eric, realist painter/collector (represented by Art Modern Gallery and trained under Nelson Shanks, Andrea J. Smith, and Brandon Soloff) and Lansing Moore, licensed art conservator and owner of the oldest continuing running decorative arts studio in New York City (since 1902). Additional resources and help have been provided by the American Art Archives of the Smithsonian Institute, Sothebys, Christies, Spanierman Gallery, the Frick Museum, among others. -There is no book currently in print on Emil Carlsen. The last book in print about Emil Carlsen were exhibition catalogs from 1999 and 1975. Both are highly sought after in the out of print market, selling for hundreds ($250 on average) of dollars each with up to a two year waiting list for a copy. No book every has been written covering the artists entire life’s work. - Emil Carlsen is considered among Classical Realist painting circles to be a hero and model. Classical Realism is one of the fastest growing segments of the art market today. Studios to learn Classical Realism have multiplied by about 100 times in the last five years. There were about 10 major studios of Realism just 5 years ago -- now there are about 150-200 studios worldwide. 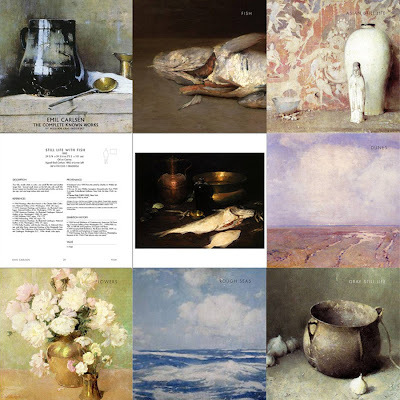 - No past catalog on Emil Carlsen ever considered more than one or two areas/subjects of his work or has tried to view his work within context. - Approximately 100 paintings or less of the 1000+ known works are in museums making this painter accessible to collectors and this book an invaluable resource. Many museums de-acquisitioned his work after his death to raise funds for more well known Impressionist artists (who were Emil Carlsen’s closest friends). Works by Carlsen regularly come up for auction (approximately 300-400 lots in the last 10 years) selling for approx. $1000 - $50,000 each. With the last 2 years selling at record levels. - Emil Carlsen created art in a transitional period in history, similar to our own time, and is seen as relevant to today's artists and appeals to today's collector tastes. Realist artists today look to him for compositional ideas for still life and landscape paintings. Similar paintings that show his influence can be seen filling magazines like American Art Collector. Would love to know when this might be available! Looks like a wonderful book. Will it be available soon? So looking forward to this book! Any news on publishing date?